In 1847 settlers though West Jordan to be their new Zion, or Holy Land, thus naming it after Israel’s River Jordan—an historical reverence that has imbued a distinctive sense of place. Agriculture, mills and mining drove a progressive economy, which produced one of the first sawmills and leather tanneries west of the Mississippi. Today West Jordan is one of the fastest growing Utah cities, spurring downtown redevelopment projects and the new TRAX light rail line. Juxtaposed against the town’s history is the overarching landscape that was the natural habitat for the Elk, which is the state animal of Utah. In Native American lore, the elk symbolizes personal bounty or plenty, and the attributes to empower you to take the next step as you journey towards your goals. Finally, the origin of the root word “nov” references “new.” Novitas means freshness, newness, novelty. To fuse the history and symbolism of all the above into an energy that people will want to be a part of, we’ve assigned it a name: Novi. This story is an invitation to Embrace the Novi. 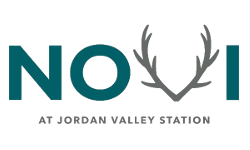 Novi at Jordan Valley Station welcomes your pet! Our apartments accommodate up to two pets per home, with no weight limit. Additional deposits and breed restrictions apply. Your pets will love it here!